Advance Tool for Backup Recovery tool exhibited here is one of the best amongst all. The process involved in it is smooth fast and provides an easy user interface for users to perform the retrieval process which helps in finishing the extraction of the backup files within no time. The ms backup repair software has a plus point i.e., the free trial run is provided to ensure the trustable base created for the user. 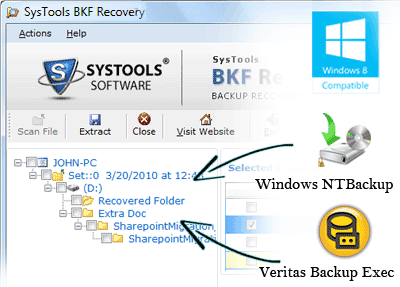 An advance tool for windows backup recovery comes with the provision of security in the process of retrieval; which prevents any stored data in the backup files from getting tampered. This add on feature helps users in creating a trust base on the abilities of the software utility and perform the recovery process without worrying about losing any database from their backup files. This also builds confidence level in the user for the further usage of the tool. BKF Repair software's Personal License can be attained for just $89 and the Business License can be fetched at only 180 dollars.